Line a cookie sheet with saran wrap. 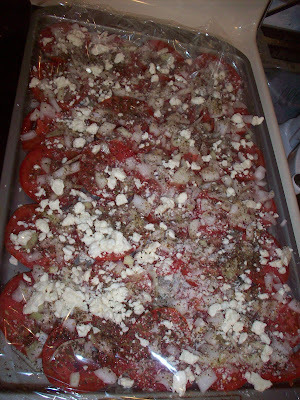 Lay thickly sliced tomatoes in a single layer on wrap. 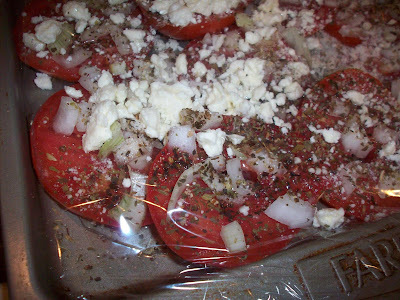 Sprinkle on some salt, pepper, chopped sweet onions, garlic powder, oregano, basil, Parmesan cheese, and feta cheese. Sprinkle with olive oil. Let set for about one hour before serving. IMPORTANT NOTE: Do not refrigerate as it changes the flavor of the tomatoes. These look delicious! All of my tomatoes are still green!! I think I will give these a try when I have some ready though! Oh my those look so good! I am going to try that as soon as we have ripe tomatoes! those look great! You should come link your recipes up to my What's Cooking Wednesday linky! Thanks for sharing! oh my goodness, that looks amazing!!!!! I wish my husband liked tomatoes, I would love love love this! I'll be harvesting my tomatoes soon and i can't wait to try this! Sounds delicious, and I love anything Greek inspired.